﻿Dharmas was better known to those that knew her, as Jemima. Her mother Corona (Coco) was a beautiful chocolate colour, with a lovely shape and an exquisite head. . In choosing a beau for her we had a specific list of criteria which was headed by the need for a relaxed, intelligent mentality. Champion Hekla Royal Brigadier of Fargaze was chosen and surpassed all expectations in stamping his wonderful character as well as sound physique At the time we lived in Sunningdale, next to Tittenhurst Park (Ringo Starr's home at that time, though we never knew or even saw him) and near to Wentworth Golf Club, which seemed idyllic for walking and having open spaces, away from the roads. Unfortunately, the area was extremely busy with traffic and having lost Jemima's sister, Torquelle, in a road accident, we decided it was imperative that we move to an even more rural location. Thus Jemima's new home became Comptonwood, at twelve months of age and she lived there in splendour for fourteen years. ​Every one of our Salukis has something in their character that is both memorable and enjoyable to think about but Jemima was such a revelation, after living with her predecessors. 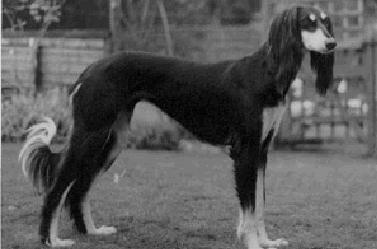 She was a truly multifunctional Saluki, being firstly, an intelligent, loving, family member. Her show career was highly successful, she coursed with great pluck and instinctive desire, her children have been successful in both traits and provided us with a line to be proud of. Some highlights have been as follows:- going Best in Show at the Saluki or Gazelle Hound Club Limited Show. Being placed Reserve Best in Show at the Saluki or Gazelle Hound Club Championship Show. She won the Sandpiper trophy for top coursing/show dog. Jemima had two litters, the first to Ch Shamal Kharaz, with two UK Champions being produced from this litter. They are Eve and Ezekiel. Her second litter to Saklawi Baksheesh produced two more champions, (see photos) Ch Kasaque Flores of Sabaka and Ch Kasaque Firuze. Fanuch (see photo with Flores & Rosemary Redfern, owner of Flores) had 2 CCs before his untimely death. Dharmas changed our Salukis. Her descendants have had her quick grasp of situations, ability to adapt and have had wonderful temperaments. She set our path for the future!! Every time we receive feed back about a puppy, in its new owner, stating how easy it is to live with and the pleasure the owners are deriving, we think of Jemima and thank goodness that we lived so many happy years with her. Also that these pleasure can be continued, through her heritage, in years to come.